This post initiates an extended project I’ve given long consideration to pursue on Timberlines. That is, writing more extensively on my long running interest in the study of natural history and in particular the history of early naturalists as well as the development of various scientific disciplines within the broad field of natural history. One of the major influences in this hobby was my grandfather and namesake, Charles P. Berolzheimer, whose broad intellectual curiosity in the sciences, including botany, forestry, wood-machining among many other fields of study as well as my exposure to his extensive library which he developed over a lifetime of scholarship. Both during his lifetime and after his death in 1995 I was quite fortunate to receive from his collection a number of books which focused on the natural history topics I find most interesting. He was a unique individual, equally comfortable giving a technical speech on wood sciences in several languages, discussing art and enlightenment thinking or walking through the woods collecting and assembling his personal herbaria. He was particularly fond of trees and fungi. My access to this collection of books has spurred my own further research into these topics, sometimes in specific technical fields, but more generally focusing on the human side of the story of those individuals who advanced knowledge in particular areas of interest, the early field naturalists, discoverers, catalogers or researchers. My first post in this series covers Hough’s American Woods. I’ve selected this work as a first post not so much due to Hough being an early pioneer of natural history study, though the scope of his work and focus on documenting physical wood samples of American tree species was indeed pioneering in many respects, but rather as this work strikes a bit closer to home for me with respect to the influences of my Grandfather and his interest in area relative to wood processing and treatment. Hough’s work is a multivolume collection of wood cuts including the Transverse, Radial and Tangential section to show physical specimens exhibiting the natural character of woods, both native and introduced to North America, that he considered import to the study of forestry. The series in total includes 14 volumes and 350 individual species. Each volume includes both the section samples of 25 species as well as a bound pamphlet describing the individual species general and technical information as well as general information covering a range of topics from taxonomy, botanical identification of parts of trees and on the geographic area specific to each volume. The author, Romeyn B. Hough, personally supervised the selection of living tree samples of each species to assure accurate identification and production of the physical sections. The final 14th and final volume was published posthumously in 1928 with his daughter writing the pamphlet. Given the broad geographic distribution of species extensive work required to identify, harvest and prepare these samples it’s not surprising the publication of this multi-volume work spanned from 1888 to his death in 1924. The specific care to assure proper drying, cutting and preservation of actual wood samples that would stand up without degrade now over 100 years later relates specifically to the technical study of wood chemistry and machining that my grandfather dedicated his own professional career to given our company’s role in supply of wood to the Pencil Industry. American Woods is certainly a labor of love, which in his first Volume Hough dedicated to his own father, who in addition to his influence in Hough’s study of nature he also credits the original suggestion of the pursuit of the body of work covered in this entire series, officially titled, The American Woods, Exhibited by Actual Specimens and with Copious Explanatory Text. Naturally of all the possible woods in these volumes I’ve chosen to feature sample number 141, Libocedrus Decurrens, or California Incense Cedar. This species is included in Part VI (published in 1895) which covers specifically woods of trees found growing in the Pacific Slope of the U.S. (a scan from my personal collection is shown) (today the Genus Calocedrus has commonly replaced the original taxonomy Libocedrus). Incense cedar first began to be investigated for pencil production around 1906 by our family members at the Eagle Pencil Company and produced commercially into slats at their Hudson Lumber Company mill. 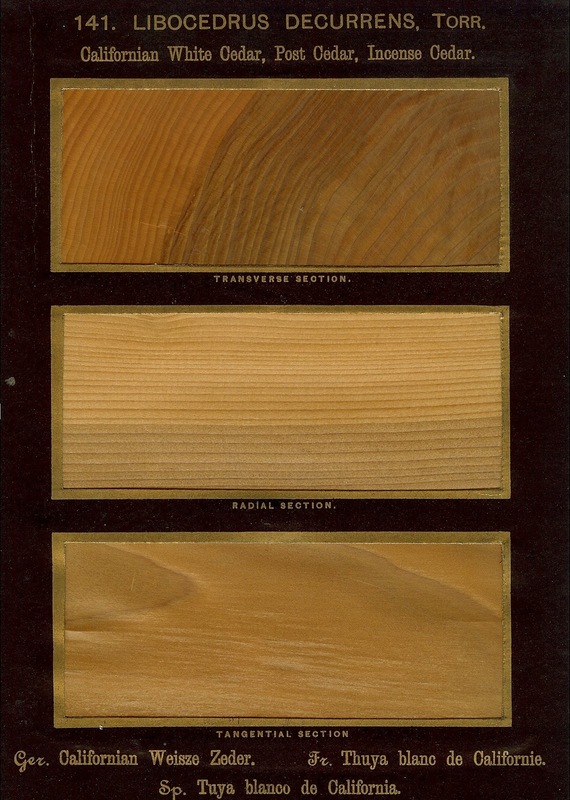 For more information on Incense cedar in pencil slat production, read here. Originally, this collection sold for $5 per volume. Today a complete set including the 14th Edition sells for tens of thousands. You can see all the wood cuts from Hough’s American Woods on line here.